I am pleased to share with you our third annual performance report to the American public and our stakeholders in the transportation community. As each year progresses, the Federal Highway Administration (FHWA) Office of Research, Development, and Technology (RD&T) seeks out new and improved ways to provide high quality research products and technology services to our customers. It is important to realize that research is not an end in itself, but an investment. There are significant transportation challenges that face our Nation today, and we at RD&T conduct research aimed at improving safety and security on our highways, enhancing mobility, and improving the condition and performance of our roads and bridges. The FHWA research and technology (R&T) program directly supports the goals of the Agency and the U.S. Department of Transportation (USDOT). Fiscal year (FY) 2004 was eventful, and everyone in the R&T program can attest to many challenges and accomplishments. It was a challenge to carry out the work we planned without a budget and long-term authorization in place. However, RD&T researchers and staff made a number of accomplishments and notable achievements that are highlighted in this report. Also, over 60 multiyear program plans were developed to provide direction for future R&T activities, and a new exhibit showcased FHWA's Priority Market-Ready Technologies at the Transportation Research Board's Annual Meeting and the American Association of State Highway and Transportation Officials (AASHTO) National Research Advisory Committee (RAC) meeting. There will be some exciting new developments in the upcoming year for the FHWA R&T program. I am pleased to announce that Debra Elston will be the Director of the new Office of Corporate Research and Technology. This office will facilitate the FHWA R&T Leadership Team's effort to carry out the 26 agency commitments under the Corporate Master Plan. It is the goal of our office to serve you by providing high quality research products and technology services. 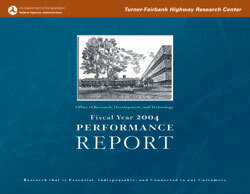 We encourage you to provide us with feedback on this report through the Turner-Fairbank Highway Research Center Web site at https://www.fhwa.dot.gov/research/tfhrc/. As always, we hope that this report encourages you to learn more about RD&T's people, labs, services, and research.